Today outfit was inspired by my love of leopard prints (or any animal print for the matter). Last weekend during the Labor Day Sale weekend, I found this wonderful clutch on clearance, and I instantly had to have it. 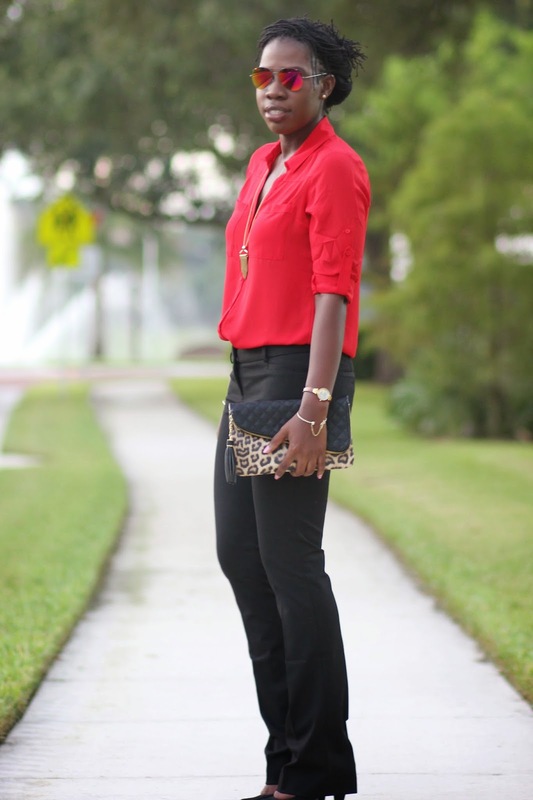 I decided to pair this clutch with my red top that I recently purchases from Express Mega Sale last week. Some people think leopard patterns are hard to style around, but the color family of this blouse goes really well with leopard prints. Red tends to be the popular option when paring leopards, but emerald green goes well with it as an example here, as well as bright orange as an example here. I look forward to showing you many more color options when pairing animal prints (since that is the current rage now). I'm realizing my taste more and more now, and I find I prefer to take my time and shop for one pieces at a time that is both budget friendly, but at the same time have higher quality material. If you spend a little more, you will notice clothes just last longer when they are made better. Nail Color is Starfish by Sinful Colors & My makeup consist of what I consider my essentials, blush is M•A•C Raizin Matte Blush, my lip color is Choco-Liscious prep with the EOS Lip Balm . Love your style my sweet kreyola. Thanks sweet Maggie :D. Appreciate the comment as always ^_^. It took me a while to realize the importance of quality over quantity and even now I'm still struggling with it but you are so right. 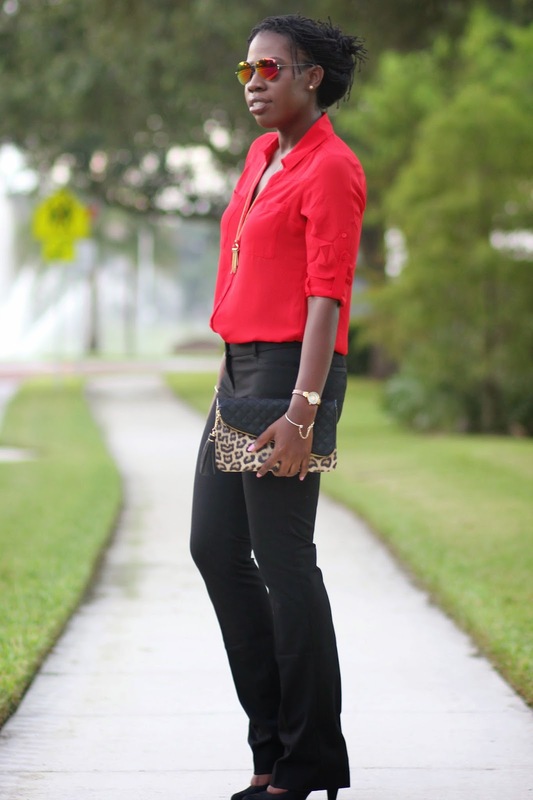 This is nicely put together look for work and your pants are amazing. 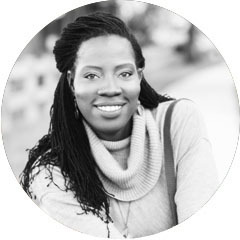 Quantity over quality is a consist battle, especially when you are on a budget. Thanks for the comment as always. Kreyola you look darling, drop dead gorgeous, chic, elegant, feminine.....you name it, I am in love with your outfit today. It's PERFECT! There ain't no other word, just perfect from head to toe. 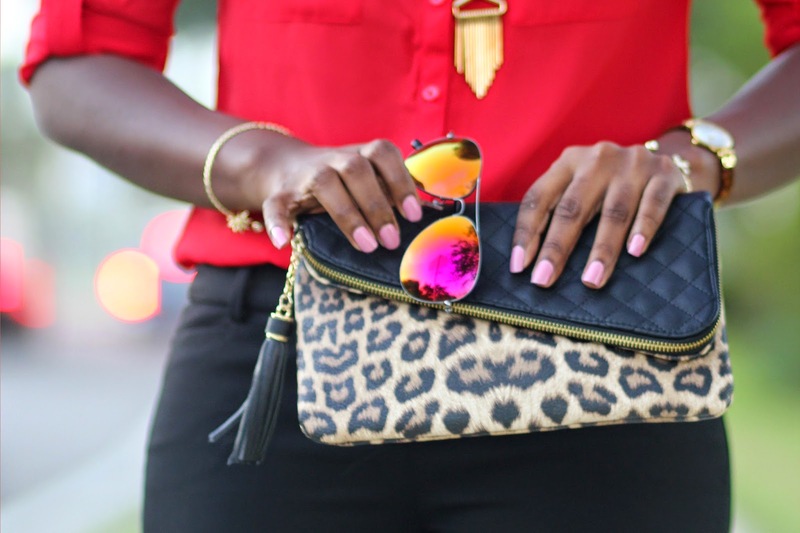 I want that clutch! So elegant and chic!! Have been loving your style lately!! Thanks Diana ^_^. I myself see myself improving greatly. Thank again for the amazing support :). 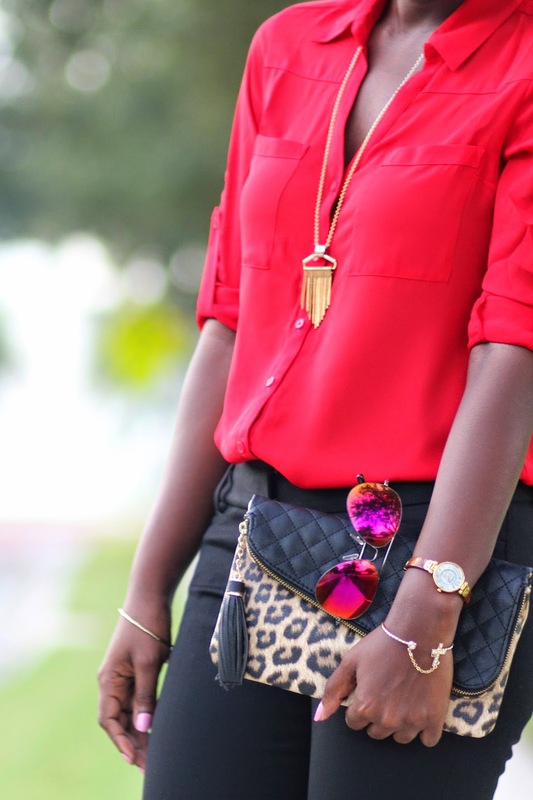 Red does look great with leopard print! Wonderful pairing! 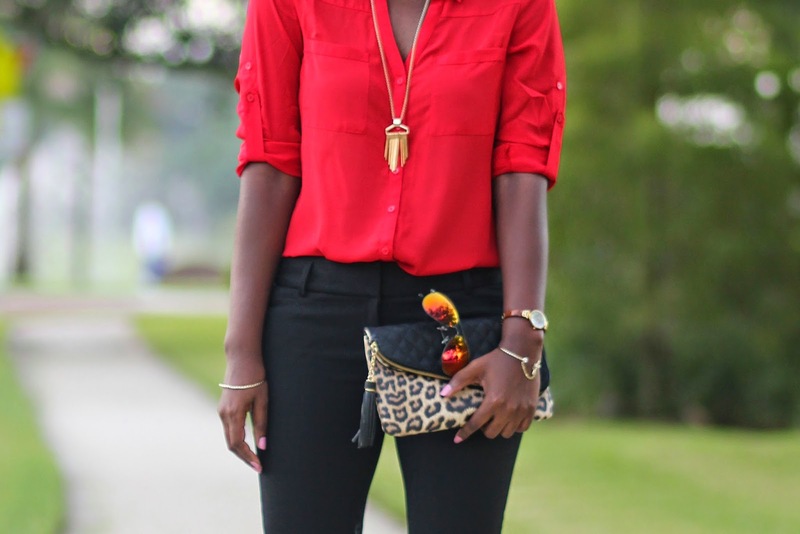 Wow what a great ensemble Kreyola.... Red is your color and I'm having a major crush on that purse! Thanks Rebecca for the comment and the visit :D.
I love red too, such a pretty and bold color. This is so beautiful and classy, yes quality is the best, this days i only buy piece that will stay years in my closet. Perfect Kreyola! Leopard is probably my favorite print ever! You styled it perfectly! Love it with the red! Thanks Kenya as always for the lovely comment. This is gorgeous! 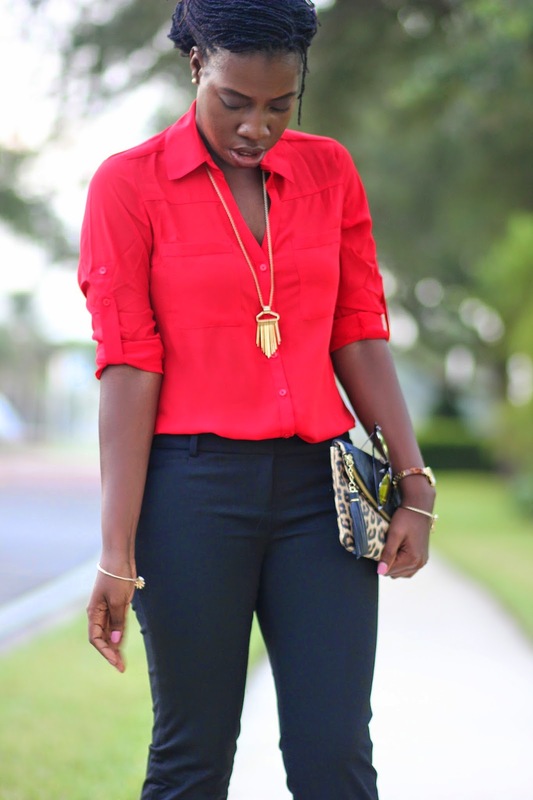 Love the bold color of your top, you look fab! Hi Gina! Thanks for the visit and the comment :D. You more then welcome to feature this outfit (I'm very honored in fact). Looking forward to seeing your post ^_^. Thanks so much for the kind and lovely comment. Love it!! I really love your outfit! I love fashion blogs. So I'm now following you on Instagram and your blog. Thanks Trica for the comment. I believed I returned the favor! Girl you totally killing it! :) Black, red and white are my go to colors, honestly I think animal prints are like a neutral, they look great with almost any color! But I'm a animal print lover! That is what I have to remember about the pieces I buy, now that I'm leaning toward quality pieces, my wardrobe is taking even longer to build. I just can't win LOL. Have a nice day sis.